Why do half of IT managers turn on less than 50% of their security features? Increasingly complex network architectures make meeting performance requirements difficult. Add in the need for security, and it’s no surprise that 77% of IT professionals end up cutting corners. In its latest network security survey, SANS uncovers the challenges introducing risk to the network and delves into what can be done to address modern demands on IT. 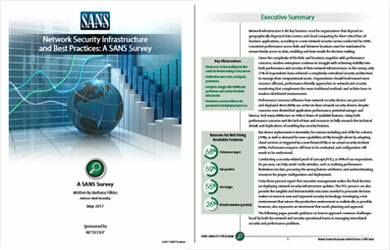 Stay in the know and get the tools you need to succeed with this latest survey from SANS. Download now.